February 2nd is Groundhog Day - it is such a neat holiday. I remember being in school and being so excited to see if the little furry bugger would predict a long winter or spring coming soon. I love sharing this fun day with my kids. This year we will start the day with a sweet book by Emily Jenkins. A Greyhound A Groundhog is a clever picture book with a simple repeating story perfect for reading to littles and perfect for February 2nd! The two furballs play around and around until they tire themselves out. The illustrations by Chris Appelhans are soft and playful. Honestly the story makes me think of little kids chasing each other and the fun they have. I loved this simple story beautiful pictures and tongue twister style. It is sure to be a fun read on Groundhog Day. Some additional things I will add to the celebration are some free printables - including this freebie on Teacher's Pay Teachers. As well as a few activities like the dot to dot on abcteach.com. 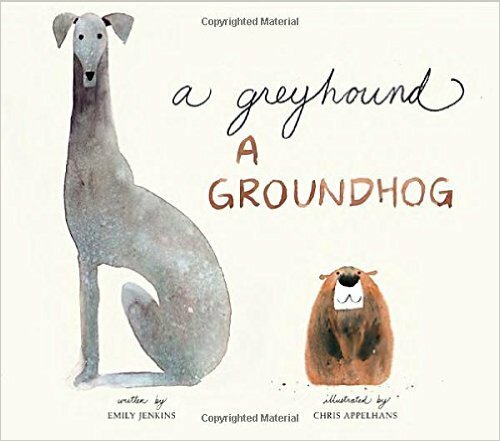 You can get your copy of A Greyhound A Groundhog at your local book store or online at stores like Amazon. How will you celebrate Groundhog Day in your home?